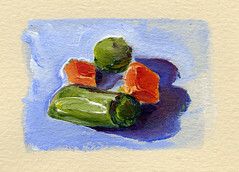 The latest free postcard art is a teeny tiny painting of some frozen mixed vegetables. Seriously, if the painting were much smaller it could be the stamp. If you would like to receive this postcard, leave a comment and email your delivery address as per the instructions here. Too late for this one? The third postcard is still looking for a home. I always love a bag of frozen vegetables. Do I win? Do I need to send my address again? I'll try again as well. We're waiting for the postcards that feature Pappy! Okay, I've got the Yahtzee dice and cup. I'm tossing it... and it's a two. Megin is the big winner. Woohooo. Keep trying everybody, and a card will surely come your way. Cool! Lookin' forward to it.